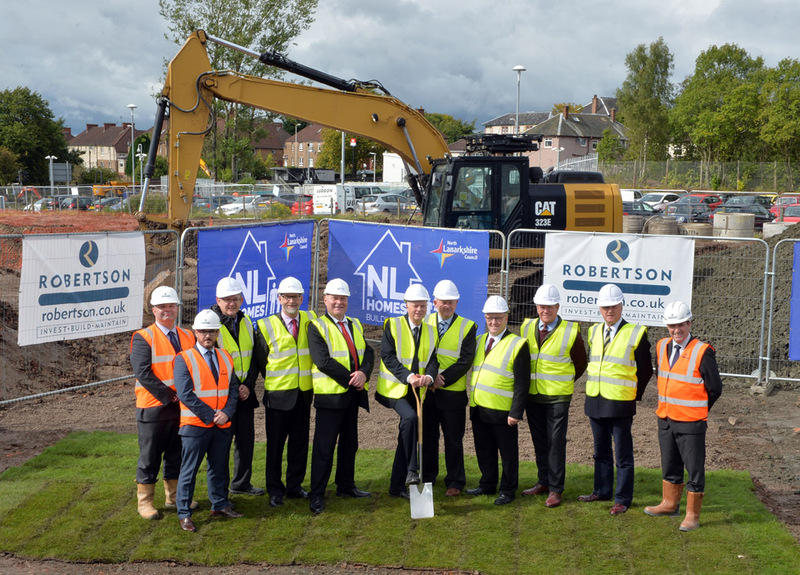 Construction is underway on the site of the former St Ambrose High School in Coatbridge to deliver another exciting new council housing development for North Lanarkshire. The development sees North Lanarkshire Council working jointly with Scottish Veteran’s Garden City Association (SVGCA) to include a shared ownership arrangement for six properties that will be used to accommodate ex-service personnel. A sod-cutting event took place at the site on Blair Road, to signal the start of work to build 40 new homes — a mix of flats and family homes, together with a number of wheelchair compatible properties. These homes form part of the council’s ambitious new council house building programme, NL Homes, which will see 2,150 new homes built by 2027. Cutting the sod was Councillor Allan Graham, Convener of Enterprise and Housing who was joined by local Councillor Bill Shields and Councillor Alex McVey. Also attending were representatives from North Lanarkshire Council’s Enterprise and Housing Resources, the Scottish Veteran’s Garden City Association and Robertson Partnership Homes. Councillor Graham said: “It’s great to be here and to see the progress that is being made across so many sites in North Lanarkshire as part of our NL Homes Programme. Our new-build programme supports our vision to provide affordable, good quality homes within safe and sustainable communities for the people of North Lanarkshire, and I’m pleased that we have been able to commit investment in new and improved housing. Richard Callander, Chairman of the Scottish Veteran’s Garden City Association (SVGCA), added: “This housing project is a wonderful example of joint working to create housing for veterans who are disabled. All the new homes are built with energy efficiency in mind. In addition, they meet Housing for Varying Needs specification, which means homes are more accessible to adapt to tenants’ mobility needs. The homes are also ‘Secured by Design’ accredited, which involves Police Scotland architectural liaison officers having input into the layout and designs to ensure we build safe and secure environments. The contractor for this development is Robertson Partnership Homes and the estimated completion date is September 2018. Gareth Edwards, Contracts Manager for Robertson Partnership Homes Central said: “The housing development at Blair Road, Coatbridge, is one of eight projects Robertson is delivering in partnership with North Lanarkshire Council, procured through Scape Group’s National Major Works framework.